Achievers was pleased to once again participate in the Ghana Islamic Tournament. This year, events were held from the 6th to the 21st of June. This was the 2nd tournament since inception last year, where amongst 25 schools, Achievers won 7 out of 15 awards. The girls competed in several events including Scholastic bowl, Poetry and Quranic recitation, and proudly came out as the 3rd Best ‘School’. Congrats to our dear Samira Mohammad for receiving an award as the most outstanding student in the ENTIRE tournament! 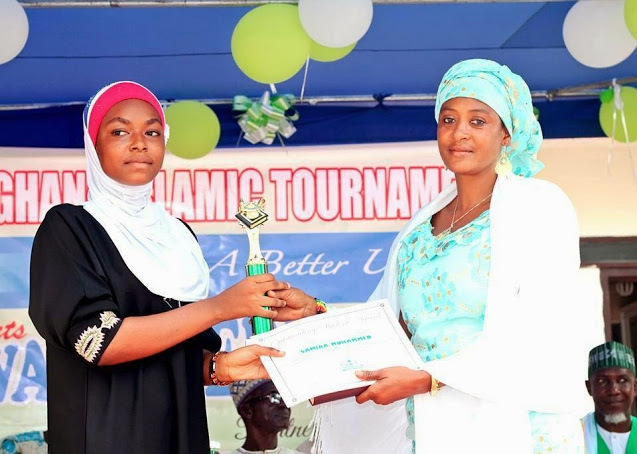 This entry was posted in Uncategorized and tagged awards, Ghana Islamic Tournament, GIT, Samira Mohammad, Tournament. Bookmark the permalink.